Our 2003 SeaVee 260B center console is equipped with twin Honda four stroke engines, full state-of-the-art electronics and all the USCG safety equipment needed to make your trip a safe and enjoyable one. We trailer our boat, which gives us great versatility. Winds, tides, water temperature and other factors can change the game on a daily basis, so we'll launch from the ramp that's closest to the best fishing grounds. This allows us to cut down on running time and give you more fishing time. Most often we'll depart from Pamet Harbor in Truro or Pleasant Bay in Chatham. Our tackle is the best the industry has to offer. 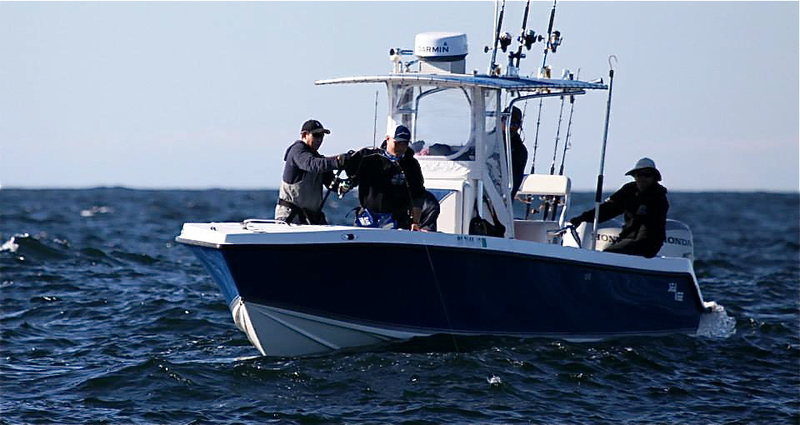 We carry a full line-up of fly, light spinning, and all the jig & pop gear needed to land that monster bluefin or shark.